A big thank you to all of you who follow me. This is a good milestone to have achieved. I hope you continue to follow my blog and feel free to comment anytime. This entry was posted in Medical Tourism, Medical Travel, Workers' Comp, Workers' Compensation and tagged Blogging, Medical Tourism, Medical Travel, Workers' Comp, Workers' Compensation on January 26, 2015 by Transforming Workers' Comp. Blue Cross and Blue Shield released a report on Wednesday called, A Study of Cost Variation for Knee and Hip Replacement Surgeries in the U.S. The report is a collaboration between Blue Cross and Blue Shield Association (BCBSA) and Blue Health Intelligence (BHI). The report analyzed three years of independent Blue Cross and Blue Shield (BCBS) companies’ claims data for typical knee and hip replacement surgeries to further assess cost variations across the US. According to the findings in the report, some hospitals across the US charge tens of thousands of dollars more than others for the same medical procedures, even within the same metropolitan market. BCBS examined markets across the country, and found that their costs can vary as much as 313%, depending on where the surgeries were performed. Knee and hip surgeries are the fastest growing medical treatments in the US, according to the report. The report cites a study in the June 2014 issue of Journal of Bone and Joint Surgery, that stated that typical knee replacements more than tripled and that typical hip replacements doubled between 1993 and 2009. A report from the American Academy of Orthopedic Surgeons found that in 2011, there were 645,062 typical hip replacements and 306,000 typical knee replacements. The report contains three figures and two maps that highlight the cost variations. Figure 1 shows the cost variation for knee replacement. Figure 2 shows the cost variation for hip replacement, and Figure 3 shows the highest and lowest average cost markets and variance cost markets for knee and hip replacement. In the 64 markets that were studied, the average typical cost for a total knee replacement was $31,124. The lowest cost was in Montgomery, Alabama, and the highest cost was $69,654 in New York City (where else but my hometown?) Within a single market, the cost variance was between $16,772 and $61,585, a 267% variation, in Dallas. The average typical cost for a total hip replacement was $30,124. Naturally, the lowest cost for hip replacement was again in Alabama, only this time in Birmingham. The highest cost was in Boston, as much as $73,987. Boston also had the greatest cost variation within a single market, as low as $17,910, or a 313% variation. For knee replacements, the largest markets had cost variations greater than $18,701, and for hip replacements, the largest markets had cost variations greater than $17,301. This report is by no means the first, nor will it be the last study of its kind to example cost variation between and within markets. While in school for my MHA degree, I learned of a previous study that found similar variations in cost, albeit for other types of procedures. But what sticks out in this report is the fact that some of the markets that had the highest cost variations, for example, Texas and Oklahoma, are opt-out states as far as workers’ compensation is concerned, and that another state, Tennessee, has been targeted as the next state by an organization called AWARC. In fact, it was reported today that a state legislator will sponsor opt-out legislation. So tell me again why implementing medical tourism, with the lower cost and better quality outcomes available in the US, is a bad idea? As this report shows, cost variation for the two most common surgeries in both health care and workers’ comp is so expensive in certain markets across the country, and within a market, that an alternative to the high cost of surgery will need to be found. And while we are on the subject of bad ideas, do those who think like that really believe that workers’ comp patients would be sent to places in other countries where the medical facilities are sub-standard, or even primitive? Of course not, but then again, if you want cheap surgery, I hear Alabama is pretty reasonable. But do you really want to go to Alabama for surgery, when you can recuperate near a beach and in beautiful weather? I don’t think so. This entry was posted in Health Care, Health Care Costs, Medical Tourism, Medical Travel, Opt-out, Workers' Comp, Workers' Compensation and tagged Health Care, Health Care Costs, Hospital Charges, Medical Tourism, Medical Travel, Opt-Out, Workers' Comp, Workers' Compensation on January 23, 2015 by Transforming Workers' Comp. As I reported last July in my article, Constitutionality of Workers’ Comp Challenged: What that could mean for Medical Travel, and three weeks later in my article, Update on Constitutionality of Work Comp in Florida, the concept of workers’ comp being the “exclusive remedy” for injured workers in Florida was ruled unconstitutional by a Miami-Dade county circuit judge. Last week, Business Insurance’s Stephanie Goldberg and others, reported that a district court judge in Pottawatomie County, Oklahoma ruled that its state’s workers’ comp law does not provide exclusive remedy for “foreseeable” injuries. The article, No exclusive remedy for ‘foreseeable’ injures in Oklahoma: Court, discusses a case involving an employee of a tire company who was injured while loosening a bolt on a wheel in February 2014. The judge ruled that the employee could sue his employer, because his injury was “foreseeable” and therefore, he did not suffer a compensable injury under Oklahoma’s Administrative Workers’ Compensation Act. It occurred to me that there was a pattern here with the cases in Florida and in Oklahoma, and that an organization called “ALEC”, the American Legislative Exchange Council, might behind these moves, but I did not find any connection to them. What it does signify is a return to the kind of world that existed in the years before workers’ compensation was enacted in all fifty states. Workers who were injured on the job would sue their employers, if they were able to go to court, and try to get their injuries paid for. 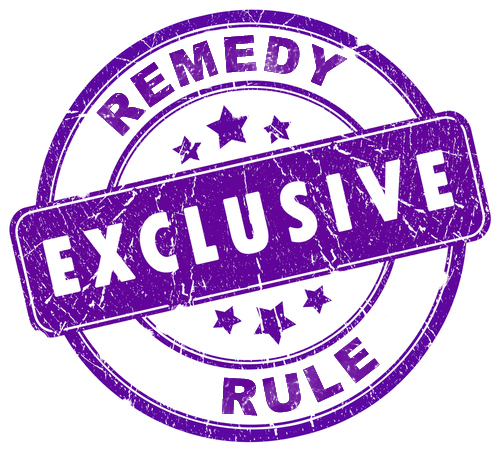 What the exclusive remedy did was to create a “grand bargain” whereby the employee gives up the right to sue, and the employer, or his insurance carrier, pays for his lost wages and medical care. In Oklahoma, this comes after the state authorized some employers to opt-out of the state’s statutory system, as I mentioned in my article, Opt-out as a way in: Implementing Medical Tourism into Workers’ Compensation. I am all in favor of giving employers some flexibility in their workers’ comp program, and unlike what is done in Texas, where some employers simply go without, while others opt-out or are a part of the system, Oklahoma requires employers to follow certain guidelines. Yet, this ruling, and the one in Florida, do not bode well for the survival of workers’ comp as a whole, and that would be a sad day indeed. What does this mean for medical tourism and workers’ comp? Well, if these rulings hold, and workers’ comp is ruled unconstitutional, one of two things would happen. Either, state legislatures would have to rewrite their laws, or we would go back to the bad old days before workers’ comp enactment. Then you would have a “wild, wild, west” of lawsuits and injured workers losing their cases. If there is a workers’ comp version of the NRA, they would be very happy indeed with that outcome. What it would mean for medical tourism? It would probably be a boon, because then more injured workers would be able to go out of the country for needed surgery, but the question as to who would pay for it would need to be determined. It could be paid for under group health, but that would cost-shift a workers’ comp claim to health care, or it could be paid for out of the settlement. Let’s hope that there are wiser heads around to prevent what would be a mass catastrophe, as far as injured workers and their families are concerned. This entry was posted in Constitutionality, Exclusive Remedy, Medical Tourism, Medical Travel, Workers' Comp, Workers' Compensation and tagged ACA, Constitutionality, Cost-shifting, Exclusive Remedy, Group Health, Medical Tourism, Medical Travel, Oklahoma, Opt-Out, Workers' Comp, Workers' Compensation on January 19, 2015 by Transforming Workers' Comp. For my first post of 2015, I want to go back to a subject I wrote about last year, namely the fraud and abuse perpetrated against injured workers by their employers, by lawyers, by the medical profession and the insurance industry at large. Wall Street hedge funds and private equity firms, in particular, who are taking an greater interest in the workers’ comp industry, and as has been written extensively about, are buying up various workers’ comp service providers, thus shrinking the industry and squeezing every last drop of profit from the claims process while cutting back on services, or even raising the price of those services. I discussed the issue of fraud and the plight of an injured worker I called “Ms. X” in two articles; the first article, The Stench of Fraud: Why Workers’ Comp Can No Longer Be a Closed System, dealt with the use of phony or unapproved implants, the second article, The Stench of Fraud, Continued, described the ordeal Ms. X suffered after being injured at her place of employment. Today’s article, also highlights the ordeal suffered by an injured worker, who I will call “Ms. A”. The following text below is the actual words written by Ms. A on her personal blog, with some minor editions by myself. I will point out that Ms. A was an executive with a very large corporation, whereas Ms. X was an employee of a small firm, and was not an executive. This will give the readers some idea that the fraud and abuse is not confined to low income or clerical workers, but could be experienced by anyone, at any level of employment, so long as they are not the owners or managers of companies. January 9, 2015 marks 3 years since a witnessed slip and fall at _________ by ________________ in Big Bear, California and Traumatic Brain Injury. Still waiting for medical care and benefits. Thousands and thousands of dollars have been paid out in evaluations; very little in the way of ‘medical care’ requested by treating physicians. Friends have suggested that since _________________________ and it’s Work Comp carrier, CNA Insurance,…refuse to provide medical care, and continue to refuse to reimburse nearly $30,000 in properly submitted medical expenses for mileage to their designated doctors and medically necessary treatment that they unlawfully denied, that GOFUNDME might help. I lost professional credentials…. Hawaii Real Estate Sales License, California Real Estate Broker’s license, and California Notary license. Failures to provide medical care, disability benefits, and return to work opportunities! Thanks _______. I was basically thrown out of a public CAREER NIGHT at ________________ Indio in December 2014, which was a public invitation to learn more about the company and working as a sales person. I was able to say hello to several co-workers while HR pondered on what to do with my attendance at their public event. The Project director advised that Human Resources said he could not talk to me, and… LOL, I was the only person from the “PUBLIC” who showed up for the event. Social Security Disability has been denied twice, and Long Term Disability is at constant threat of being discontinued, despite the policy and fiduciary responsibilities. Some say that upon diagnosis of anything to do with Brain Injury, Work Comp carriers fully and immediately breach fiduciary responsibilities and expedite 3D practices….”DELAY, DENY, DECEIVE” rather than to expedite immediate medical care to mitigate harm and risk. The first year, I could hardly speak, and leaving the house was only ‘as necessary’ to various doctor evaluations. My speech is still ‘dysfluent’ but improved. I experience cognitive fatigue more often than I care to admit. There are other impairments, but being a sales person and personal-development-activist who has walked on fire and bent rebar at the throat chakra, I muddle along to the best of my abilities. If you remember 286 computers and dial-up, no clip-board, no copy and paste then you have an idea of what it can be like living with a brain injury. I am a “High IQ TBI and Work Comp Survivor” Some new and old friends say I am still brilliant, just different, and much slower. Typing is still a strong suit. Different lobes govern different functions. The brain is an amazing organ. Neuroscience is truly the New Frontier. Ask a Veteran today! One doctor, in 2012, advised to “never tell anybody you have a brain injury, as it has a stigma”….He wanted me to spend out of pocket $500 for a day-planner to conceal the impairments. I didn’t start screaming loudly about it until year two, when I could better grasp the extremely dangerous situation I was in as an Injured Worker in America. It became very clear what a corrupt and vile system Work Comp in America, and elsewhere, is. Consider Japan’s Nuclear Meltdown workers. If you say Work Comp is none of your business, I must assume you are not part of the Human Race. I gave a ‘timeshare tour’ at 9 am, and I was very apologetic for my extreme confusion and disorientation and they were grateful for a short tour, and a fast gift. Around 10 am, the administrative manager asked if I was going to a doctor, and I asked if I had to see any special doctor. He said, “See any doctor that accepts work comp” and provided me with an incomplete DWC-1 form, that had no insurance info on it. I drove down an icy mountain after the last tour of the day, about 20 miles, then another 40 miles of flat desert. How? Dunno! Just did. Nobody thought I might need a ride to a doctor, or a hospital, or even a 911 ambulance ride? I haven’t worked since, and I have spent more than $30,000 out of pocket to discover and obtain help for brain injuries. Had I received immediate and appropriate care, I am told I might have returned to work that first year. Recently, after denied TTD and PD benefits for months, and years of failures to authorize medical treatments, the attorney for _______suggested that if I reviewed the situation, it would be clear that the failure to obtain medical care is all my fault, and he further asked why I believe I am entitled to any benefits. He sent a nasty little note with his legal opinion on my medical conditions, suggesting a Court Appointed ‘Conservator’ to make my decisions, since I struggle so with the Work Comp system. It sounded to me like he was suggested I agree to let the Court appoint an insurance company goon to finish the kill? Yikes. The contempt and disdain is mutual. The insurance company and attorneys had me driving everywhere; I don’t know how I did it either. One doctor wanted me to drive with a brain injury, sleep deprived, over 100 miles for an ‘exam’ and that’s where I drew the line. I knew that was insane, and would be a danger to me and to the driving public. Where do they find those Work Comp neurologists? Haven’t met a smart one yet. You can see from her description of her ordeal, there is something going on with her claim and the claims of so many other injured workers. She is coping with this traumatic event the best way possible, but the system that was designed to care for people like her has failed time and again, and for no other reason than to protect the profits of those who are inflicting harm on her, after initially suffering an injury not her fault. A wise man once said, “for what hath it profit a man if he gains the whole world, and loses his soul,” To me, it would seem that the workers’ comp system, the legal system, the medical profession, and the insurance industry has lost its soul on the way to gaining the world and profit. As for Wall Street, two hundred years of lying, cheating, stealing, conniving, and manipulating has proved that they have no soul, only dollar signs where their hearts and minds should be. This entry was posted in Abuse, Claims, Fraud, Medical Tourism, Medical Travel, Unethical behavior, Workers' Comp, Workers' Compensation and tagged abuse, Claims, Fraud, Medical Tourism, Medical Travel, Workers' Comp, Workers' Compensation on January 9, 2015 by Transforming Workers' Comp.